Jim Shaughnessy is a guest on WGHQ. Coffee and conversation at Quick Chek on Albany Ave.
Last day to register to vote in the school election. Coffee and conversation at Monkey Joe’s Coffee Roaters on Broadway. “Meet the Candidates Night. Generally held at Miller Middle School. 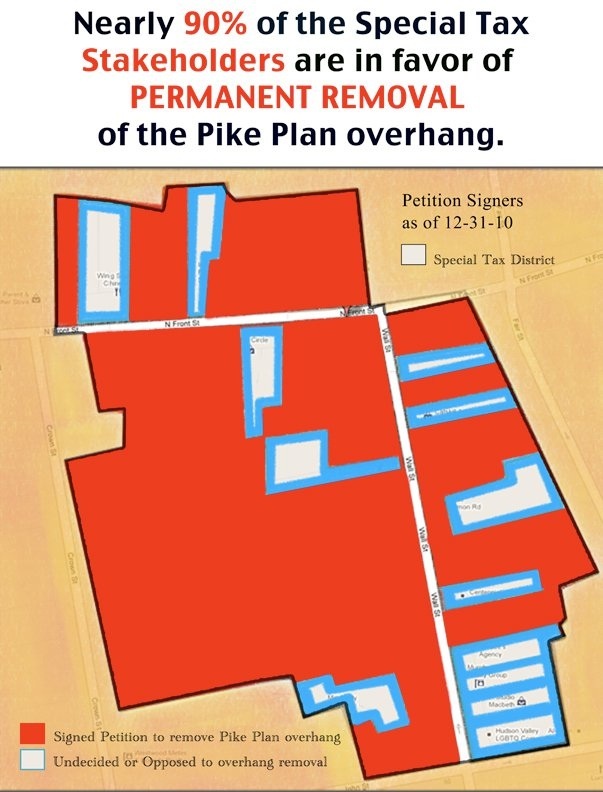 The Pike Plan process has been a real quagmire. Whether you are for or against it, here we are. A notice was sent out to the public advising that the city will hold a Pike Plan Pre-Construction meeting on Tuesday, March 1st at 5:30pm. The meeting will take place at the Kirkland Hotel located on Main and Clinton in Kingston. The purpose is to discuss the ‘Rehabilitation’ of the Pike Plan Project. In preparation for the meeting unfortunately for citizens, it will be hard to find information that isn’t polarized to one side or the other. Earlier on in the Pike Plan Commission process, there weren’t minutes kept – so what is true and what isn’t relies mainly now on perspectives. What I can suggest is that you speak to the following parties to become familiar with both sides as things currently stand. I think this organization is the most reliable in obtaining factual information as to where the project lies today. This group is opposed to the pike plan, and says that the project isn’t a rehabilitation, but a complete tear down and rebuild project that will cost far more than what is budgeted – impacting the citizens of Kingston and still covering the historic character of the buildings while diminishing business for those who are struggling under the current design. Kingston USA is made up mainly of those business and building owners living in the Pike Plan district. Kevin supports the project, and represents the ‘business’ community in Uptown Kingston. Surprisingly, there are 400 members (give or take) who comprise this organization. The majority of members are not impacted by the pike plan. KURA (Kingston Uptown Residents Alliance) is a volunteer organization made up of esteemed members in our community. Gerry is a Kingston Citizen who I hold up high. He is intelligent, investigative, and sensible. There are others who have played an integral role in the process which I will gladly share if you need more contact information. For others, please feel free to post your opinions or helpful tips regarding this matter in the comment section for citizens as they prepare for this upcoming meeting. THIS JUST IN: I received this from KingstonUSA . Feel free to contact them if you have any questions. As some are familiar, a Master Plan Facilities Committee was established to “study the district’s facilities and make recommendations to the Board of Education for a Five Year Capital Improvement Plan”. It was established three years ago in January of 2008. At this time, the committee concludes that Meagher Elementary School be closed and Sophie Finn Elementary School be converted into an alternative educational center for High School students. There is one last public comment opportunity on the subject after the MPFC makes it’s recommendations. 4:30pm: The Master Plan Facilities Committee will make their recommendations to the BOE. There is no public comment at this time. 7:00pm: Public Comment (each citizen is limited to 2 minutes each). I recommend that you attend the 4:30pm meeting if you wish to speak later on. If you do go, please post your experience in the comment section of this post. Future meetings for the Master Plan Facilities Committee are Wednesday’s at 4:30pm April 6, May 4, June 1 all at the Crown Street location. Last week on my way into Mother Earth Storehouse in Kingston, there was a young man selling pies – and delicious looking pies of all sorts that included vegan recipes – in the entranceway. He was gentle and soft spoken with the crowd that had gathered to check out the goods and to learn of a new organization that he was a founder of called “the O-Yeah: the organization yielding on end to animal homelessness“. 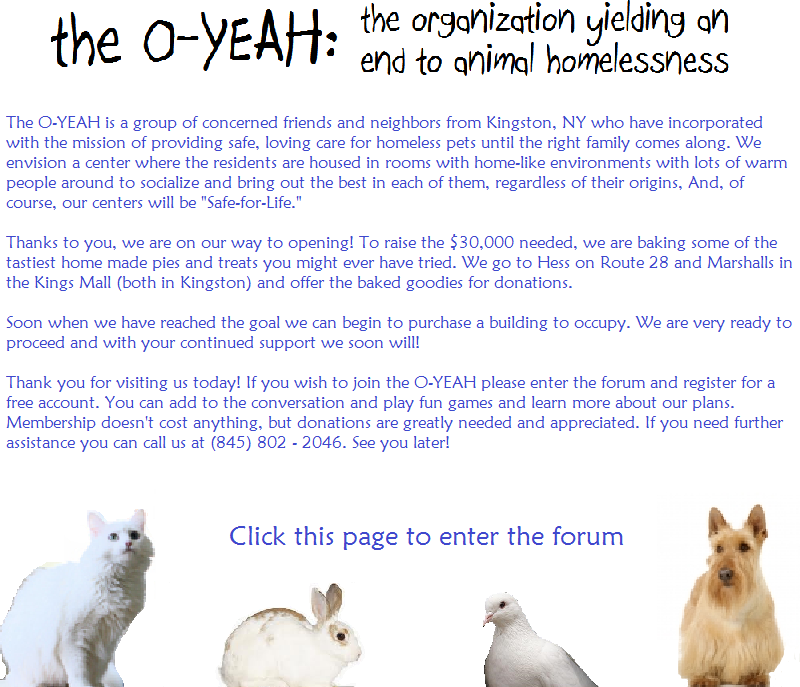 Their aim is noble and makes a lot of sense by working to end pet overpopulation in the city of Kingston. It’s a perfect illustration of hyper local, which in my estimation is what we all need to get back to in our efforts and endeavors. An organization after my own heart, I waited my turn to speak to him to learn more of what they were up to. So here’s the deal. This big hearted and intelligent crew bake pies out of their professional kitchen as a part in raising money to purchase a location in midtown Kingston. They have a website that is as interactive as it is informative. You can become a member and use their forum to get advice, support and to learn of how you can help. I love this concept and wish them the very best. Perhaps we’ll conduct an interview one of these days when they get further along so that we can learn more about several of the extraordinary youth in the city of Kingston. Until then, check out their pies. Seriously. The recent accusations that Lt. Matthews allegedy tried to ‘double dip’ by being paid twice as a city police officer and an SRO at the Kingston High School would be a bold move. Imagine, someone of his stature feeling comfortable to take the chance in requesting to be paid – twice. How could you blame a simpleton like me for questioning the oversight here and wondering where else there might be questionable department accounting? I’m no expert, but the whole situation inspires my thinking as to who is ultimately responsible. Isn’t this an executive city matter? If so, City Hall is caught with its pants down again. First the safety net and now this? Come on fellas. Get with the program. You are paid by the taxpayers to manage infrastucture and the budgets that surround it – and that’s really all. How hard can that be? Not so much for those who are qualified. There. I said it. This is more serious then electing an adminstration out and hoping that another will do better. It’s a matter of professionalism and responsibility, and that has nothing to do party lines. I have a feeling this sort of thing is pervasive and whether it’s a lack of attention or sneaky – we may never know. In the meanwhile, this isn’t acceptable and Lt. Matthew’s alleged actions may impact more than the budget. It may discredit the cases of some or all of those he put behind bars. With a six figure salary, stealing from taxpayers and then putting our safety at risk is a very serious crime. If he is guilty, then I hope he will be punished to the full extent of the law. Afterwhich Kingston – you’ve got to look more closely at department head budgets – and if that’s too much for you to do – then you don’t belong in the leadership positions that you are in. On that note, Kingston Citizens – we need to be paying closer attention. Our government is a reflection of us and if we are apathetic as a community, then how can we expect anything less? It’s a bold stance to take, but I believe that someone should be hired to run this city, as I don’t believe Kingston is served by party line leadership any longer. We don’t need the most popular candidate with the most resources to run our city (which by the way, the voter turnout is always a small fraction of the number of citizens in the community. What does that tell you?). We simply need people who are qualified to do the job.